Let's be clear about this. Buying this 7" was a real waste of money if you're looking at it from a music perspective. I'll be the first to admit it, and it's kind of silly that I bought a record I'm almost never going to listen to. But the other side of the coin is that it's a pretty neat little thing just to own. I collect records. I loved Super Mario Bros. as a kid. This 7" is just a combination of the 2 things and I thought it would be neat to own. I tried to pass on it. When it originally went on sale I hemmed and hawed over the $16 price tag for a 7" and while I was hawing, the record just sold out. I thought that was it, I just missed out. No big deal. But then it got restocked and I just couldn't resist. I don't know what makes me buy things like this sometimes. It's a character flaw I guess, but I can tell you that I am glad I got it because the packaging is pretty cool if nothing else. The sleeve folds out into a little six panel poster with one side being a big illustration and the other side has screen shots from the actual video game. There's also this sheet of paper with pictures of all the characters that seem to be meant to be cut out for reasons I can't fathom. It would make more sense as a sticker sheet. Music wise, the A-side is simply the music from the video game. Well, it's the music from the above world boards from the video game. There's no underworld music here, I would have liked that. But a nice touch is that towards the end of the 'song' it shifts into the 'time running out' sped up music and ultimately concludes with the noise of your time running out. Kind of cool. The B-side says it contains on orchestral version of the song. But it's really just the normal video game music with some odd sound effects and musical accents over some of the parts. I would have preferred just more video game music honestly. Maybe a split 7" with the Legend Of Zelda Theme? Regardless, I'm happy I bought it. 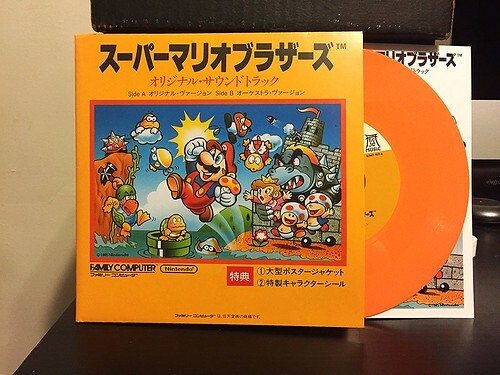 It's a cool thing to have, but as far as being a record that I'd listen to, I can't imagine it will really come out for any reason other than just to show it to someone who happens to be at my house and really likes Super Mario. Its one of my favorite games of all times, and soundtrack is also very great too! I still remember those good old days when me and my friend could play all night long on Gameboy advance emulator https://romsmania.com/emulators/gameboy-advance in Super Mario Bros.! super mario world rom is a popular and well-liked game that is played by both kids and adults alike.